Currently, in the Midwestern United States, Opioid addiction is causing the deaths of hundreds of men and women. Their deaths and the rise of Heroin use is a direct affront to the long-standing war on drugs. Former First Lady Nancy Reagan is fondly remembered for her eternal slogan “just say no”. Narcotics are still largely illegal but more states have begun to decriminalize the recreational use of marijuana which has allowed entrepreneurs to invest their savings into a new and profitable industry. The story of America’s war on drugs is long and often misunderstood. Allegations , rumors and explosive revelations have all contributed to cast the dark cloud over the battle against narcotics. Douglas Valentine decided to explore the history of the war on drugs and in this eye-opening book, he tells the story of the history of America’s battle against drugs and the rise and fall of the legendary and infamous Federal Bureau of Narcotics (FBN). Students of history will be familiar with the story of Charles “Lucky” Luciano (1897-1962) and his participation with the U.S. Government to defeat the Axis powers during World War II. The story on the surface sounds simple enough, but as Valentine shows us, Luciano was only a small part of the puzzle and there was more to his role than meets the eye. Further, the relationship between Washington and the Italian American mafia would take on monstrous proportions an in the process taint the FBN’s reputation. The bureau was under the guidance of the later Harry Anslinger (1892-1975) and rivaled the Federal Bureau of Investigation, led by John Edgar Hoover (1895-1972). Anslinger made a name for himself as a director whose agents made cases that resulted in convictions but whose personal racial prejudices and desire for recognition caused him to make decisions that would have far-reaching effects for years to come. Valentine did an impeccable task of researching the topic and the revelations contained in the book are nothing short of jaw-dropping. And the interviews with former agents of the FBN are shocking to say the least but provide valuable insight into what made the FBN a success and what ultimately led to its failure. Anslinger plays a prominent role in the book but the story heats up and takes on a life of its own as the Central Intelligence Agency (CIA) makes its appearance. Organized in 1947 through the National Security Act signed into law by President Harry Truman, the Agency, as its known, grew into an uncontrollable secret apparatus of the Unites Government that engaged in espionage, assassinations and as we learn in this book, narcotics trafficking. Rumors of the Agency’s involvement in the rise of drugs of America have held in place for decades. In fact, the allegations proved to be true and the story was broken by late journalist Gary Webb (1955-2004). But what many people did not know then and perhaps now, is that the story was far deeper and much uglier that most would be willing to accept. The FBI also plays a large role in the story of the FBN and Valentine brings the three together exposing the complicated and tension filled relationship between the three organizations. Before beginning this book, it is necessary for the reader to accept that many unpleasant truths will be revealed. A complicated web of deceit and complicity was constructed that allowed thousands of people to profit off the misery of millions. But more frightening is are ways in which narcotics were able to enter the country with the help of those in high places and the impossibility we now face of their removal. The story is filled with legendary names such as Meyer Lansky (1902-1983), Vito Genovese (1897-1968), Tibor Rosenbaum, James Angleton (1917-1987), Richard Helms (1913-2002) and Chiang Kai-Shek (1887-1975), among others. But what is paramount is that Valentine has put together an extraordinary jigsaw puzzle that allows the reader to see the dark side of governments and the reality of war as highlighted in the conflict in Vietnam. The revelations about the CIA’s role in the war alone are enough to earn the wrath of veterans still with us today. Valentine spares nothing and gives us the facts, as ugly as they are. The beauty of the book however, is the author’s genius is connecting the characters and providing a mental map of the endless connections between law enforcement, politicians, mobsters, intelligence officers and rebels of all sorts. The information is staggering and at times during the book, I literally could not believe what I was reading. And I do not believe Valentine did either as he was writing this book. I forewarn readers that as an American citizen, this book may cause grief and outrage at the actions of the United States Government domestically and abroad. It is not an easy pill to swallow but the truth is rarely enjoyable. The FBN earned a legacy as the most successful drug enforcement agency in American history, but paranoia of corruption and an internal investigation by Andy Tartaglino, devastated the bureau and changed the course of history forever. The story of the demise of the bureau is told here in the book from start to finish and it is sure to leave readers shaking their heads. Today the Drug Enforcement Agency (DEA) is the premier federal organization responsible for investigating narcotics trafficking. Time will tell if the bureau will reach the heights of the famed FBN but as we can see very well, drugs are here to stay. As we look back through Valentine’s work, we can only hope that history does not repeat itself. This book is the place to start in understanding the true nature of the business of narcotics and how it propagated throughout our world. May 11, 1987 -James Jesus Angleton, the former chief of counterintelligence in the Central Intelligence Agency, dies at the age of 87 from the effects of advanced stage lung cancer. The legendary officer, who at one time also worked for the Office of Strategic Services, had been living out his final years quietly at his home in suburban Washington, D.C. In 1974 he was relieved of his command by then director William Colby after 19 years of service. His termination came on the heels of the search for moles within the CIA, a search that nearly destroyed the agency and was headed by Angleton. David Wise presents to us his investigative report of the mole hunt, the lives and careers destroyed and the near implosion of the CIA. The Cold War escalated tensions between the United States and Soviet Union with each side engaging in covert espionage operations to gather classified information and military secrets. Agents, double agents and defectors kept the suspense high as they moved between the two nations causing panic and hysteria as the CIA, KGB and British MI6 searched for moles threatening to bring about the downfall of several intelligence agencies. Angleton, by all accounts, was a strange, fascinating and mysterious individual. Firmly convinced that a Soviet mole was within the CIA after the “defection” of Anatoly Golitsin, he and his subordinates began a crusade to rid the agency of moles and in the process, almost caused intelligence recruitment and operations to come to a grinding halt. Wise covers the operation and its many victims in extensive detail revealing the paranoia that spread rapidly as high level operatives found themselves cast under a web of suspicion. Many officers resigned from the agency once their reputations were questioned and others were simply let go. Years after both Angleton and Colby had left the agency, the Mole Relief Act (Public Law 96-450) was passed, providing compensation to some former employees wrongly targeted under Angleton’s relentless search for moles. 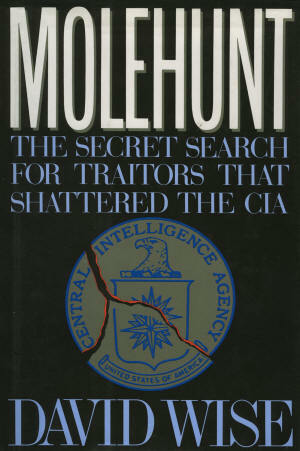 The CIA remains one of America’s most secretive agencies and the Freedom of Information Act has provided significant amounts of documents once previously classified that reveal the true nature of the operations in place during the Cold War and the hunt for Soviet moles which to this day, remains a dark period in the history of the Central Intelligence Agency. July 26, 1947- President Harry S. Truman signs into law the National Security Act, establishing the formation of an intelligence agency dedicated to serving the president. The end result is the formation of the Central Intelligence Agency. Later in life, Truman came to regret the law as the CIA grew beyond his original intentions into an unaccountable, dangerous and highly suspicious agency seemingly under the control of no one. Stories of operatives such as Allen Dulles, Bill Harvey, Richard Helms, David Atlee Phillips, Cord Meyer, Jr. and James Jesus Angleton are both endless and legendary. But what was really going on within the CIA and what was the true nature of its relationship with the White House? David Talbot presents to us his investigative report into the dark side of the CIA and the secret government within the United States. January 29, 1969-Allen W. Dulles dies at the age of 75 of complications from pneumonia in Washington, D.C. Dying with him is an unknown number of secrets of the U.S. intelligence apparatus. The former director of the CIA, former intelligence operative of the OSS and member of the Warren Commission, was relieved of his post by President Kennedy following the disastrous Bay of Pigs invasion in April, 1961. Kennedy and Dulles continued to maintain a strained relationship that would never fully heal. Although officially relieved of duty, Dulles continued to engage in intelligence operations and keep close contact with top members of the CIA. And nearly fifty years after his death, his name evokes both admiration and fear. However, as more information comes to light about the dark operations of the agency he lead, the more we are exposed to the dark side of Allen W. Dulles and his older brother and former Secretary of State, John Foster Dulles. In March, 1945, the Allied forces in conjunction with the OSS, conducted Operation Sunrise, the black operation that obtained the freedom of several high-ranking Nazis including Karl Wolff. Dulles, at the time working for the OSS, spearheaded the campaign which was done secretly under the radar of the oval office. This mission would be one of many in Dulles’ career that could have caused international turmoil and embarrassment. Operation Sunrise was followed by equally as controversial programs such as Operation Paperclip, ZR/RIFLE and MK/ULTRA the agency’s attempt at a real life Manchurian Candidate. All of the details are included in this book and the full story is beyond shocking. The agency faced its biggest challenge under the Kennedy Administration. Kennedy, convinced that he was unable to trust information provided by the CIA, vowed to shatter the agency and placed the control of covert operations under the control of the military. Following his assassination, the policy was reversed, authorizing covert operations in domestic and international affairs resulting in disastrous foreign policy which culminated with the Vietnam War. Dulles wouldn’t live to see the war’s end, but his agency’s role in the conflict is still the topic of debate. Talbot’s account of the strained relationship between the Kennedys and the CIA reveals an administration at war with its own intelligence community and one that ended violently in Dallas, Texas on November 22, 1963. Many of the figures in the book are now deceased, but the book reveals a very disturbing part of U.S. history that continues to haunt this nation and forces us to ask ourselves what power truly is and who really wields it? And just how much do we know about the intelligence community and what their objectives are? Additionally, the book a critical asset to JFK assassination researchers and those who desire to know the truth about what happened in Dealey Plaza.